Add the remaining ingredients and mix together well. Mix the spicy plum dipping sauce ingredients together in a separate small bowl or ramekin. Place the duck breast in a saucepan and cover with boiling water. Bring to a boil and blanch for 2–3 minutes before removing from the pan and running under cold water to cool. Once cool, pat the skin dry with kitchen paper and score gently using the tip of a sharp knife in diagonal cuts along the top of the skin, trying only to open up the fat and not cut into the meat itself. Rub the salt into the duck breast and then dab the skin dry with kitchen paper. Rub the five-spice onto the sides and bottom of the meat only, not the skin. Dab the skin dry once more to remove any extra moisture. Place the duck breast skin-side down in a cold frying pan and let the pan heat up to a medium-high heat, frying the duck for 6–8 minutes, or until the skin is golden brown. Press down on the sides during the frying process to ensure all parts of the skin become crispy. Place the duck breast skin-side up on a wire rack above a roasting tin and roast in the oven for 6–8 minutes to your liking (see Tip). Remove from the oven and leave to rest for 5 minutes. While the duck breast is resting, steam the pancakes. Place a bamboo steamer over a wok a third filled with boiling water. Arrange the pancakes in the steamer and steam for 3–5 minutes. 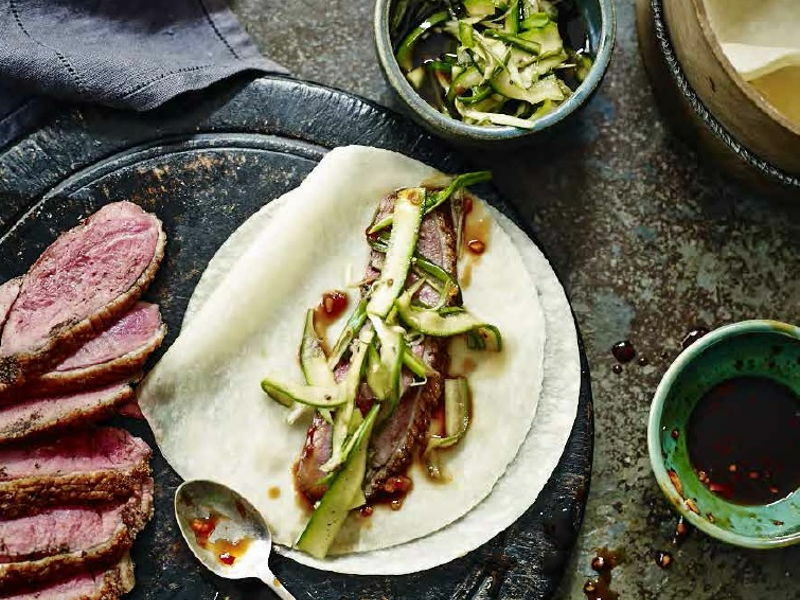 Cut the duck into thin slices and serve with the pickle and dipping sauce, accompanied by the pancakes in the steamer. TIP: To check whether the duck breast is cooked through to your liking, press it with your fingertips.If the resistance is the same as when you push your fingertips into your chin, then the duck is medium. For rare, it should be the same as pushing into your cheek, while well done will offer the same resistance as pressing against your forehead.